To donate to Rob’s bail click the donate button UNDER the thermometer on the left! 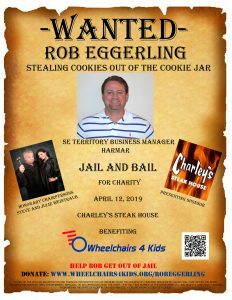 Rob Eggerling aka “Egg Man” has been charged with stealing cookies out of the cookie jar. Nobody puts baby in the corner but Rob is being put away for getting caught cookie handed. His antics caught up to him as he left behind a trail of crumbs after having a sweet tooth late one night. There’s no telling when he will see another chocolate chip cookie again! Rob has been with Harmar for 3.5 years and currently serves as the Southeast Territory Business Manager. He’s responsible for supporting 13 VA’s in his territory to help veterans get the equipment they need which ultimately allows them to remain independent in the community and at home. The other half of his job consists of calling dealers that sell Harmar equipment to give them the support and education they need on their products and services. He is also a Certified Aging-In-Place Specialist (CAPS) which focuses on home modifications for the elderly. When Rob isn’t stealing cookies he enjoys playing golf, cheering on the Rays, Bucs, Lightning, and attending concerts.